Small and medium enterprises (SMEs) can no longer avoid going digital if they want to stay relevant. And RHB Bank Bhd, which has a new five-year strategy, is looking to help them do just that. 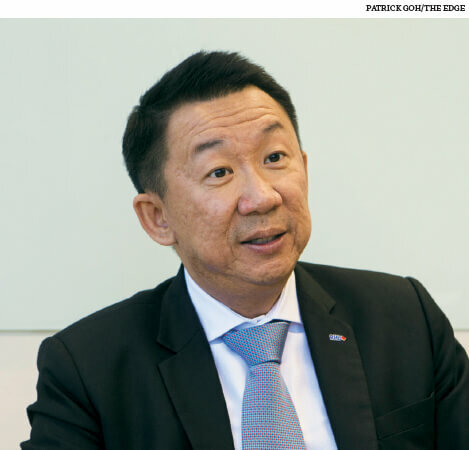 Jeffrey Ng, the bank’s head of group business and transaction banking, says the digital economy is the biggest trend impacting SMEs, and many of them will require assistance to adopt the technology. Ng was previously head of RHB’s SME division. “The business environment is definitely changing, which also impacts the way SMEs run their businesses. It is about the digital economy and we are talking about a big push into e-commerce and a cashless environment,” says Ng. For RHB, this means onboarding SMEs into its electronic financial supply chain platforms. Suppliers and buyers can perform payments for goods entirely on the bank’s platforms and receive payments instantly. SMEs that want to offer cashless payments can also do so with RHB’s solutions. If they encounter a need for financing at any point, the bank can create solutions for that particular trade. “For example, when they trade within a marketplace, the bank will have a lot of transactional information and it will be able to provide financing when required for that particular transaction when they need it,” says Ng. It is a strategy that the bank has pursued for several years. In 2015, it introduced the SME e-Retail Solution Package, which equips retailers with an electronic point-of-sale (POS) system, online cash management, cloud accounting software and mobile POS solution, among others. “Today, you don’t have to go to different vendors to get all of these solutions. Instead, you can come to RHB and open a bank account. And because you are a retailer, we can actually introduce you to an electronic POS system that gets linked to a mobile POS system, where you can receive card payments,” says Ng. Another solution it has is the iSmart tool, which helps SMEs understand RHB’s products. The bank’s relationship managers are equipped with tablets that have the programme installed. By answering a few questions on the tablet, SME customers can understand what solutions could work for their specific situations. “The model immediately gives them a sense of how much they have to pay and what is available to them,” says Ng. iSmart also allows SMEs to measure themselves against their peers in the industry. Going forward, the bank plans to create more products that are designed based on the ecosystem SMEs operate in. For instance, one solution it is working on is a tool that will allow SMEs to apply for financing digitally. “Today, they can already apply for a long or current account through the SME portal. After that, they can just go into a branch and obtain the account instead of having to line up and wait to apply,” says Ng. In addition, with more SMEs in its ecosystem, RHB can utilise the data collected from digital transactions to help SMEs analyse trends such as their customer demographics and even when they should restock. “They can make informed decisions as they move along. That is what we are trying to promote within the SMEs themselves — the use of a combination of technology and information. They need to adopt a new way of thinking and running their business. And it starts with simple things like this,” says Ng. In February, RHB unveiled its five-year plan called [email protected] It identified small and medium enterprises (SMEs), mid and large-cap companies and the affluent as key segments it wants to grow. The bank aims to increase the contribution of its retail and SME segments to its domestic loan portfolio from the 69% currently to 75% by end-2022. It is currently the fourth largest bank financing SMEs in the country. “Our mission is to become the preferred SME bank in Malaysia. In that quest, we aim to be the third in SME market share, contributing 20% of RHB’s assets under our [email protected],” says Jeffrey Ng, RHB’s head of group business and transaction banking. He says the SME business has seen a compound annual growth rate of 11% over the last five years. Last year, it grew almost 10% despite financing for the SME sector only growing at 6% in general. RHB’s SME segment was estimated to have 9% market share in this segment last year, compared with 8.7% in 2016. RHB will have to face fierce competition from many banks that are also targeting the SME segment. Some are providing mentorships to SMEs while others are expanding their digital services. Ng says RHB’s strength is that it started on the digitalisation path ahead of the others. “When we rolled out the e-Retail solution for retailers a couple of years ago, we were the first in the market. Today, they come in and basically have all the solutions ready,” he adds. On the other hand, he does not see equity crowdfunding and peer-to-peer lending platforms as competitors in the SME market. “I view them as complementary to the growth of the whole SME industry, at least for the medium term. For now, they basically fill the gaps that potentially exist in the SME market,” says Ng. Internally, the bank has adopted the Agile strategy to speed up the time-to-market of its products. This method gathers people from different disciplines and co-locates them to create customer-centric solutions. “What is different is that we empower them so they can be self-sufficient with a straightforward governance structure. So, what you get at the end of the day is better collaboration, flexibility and innovation,” says Ng.